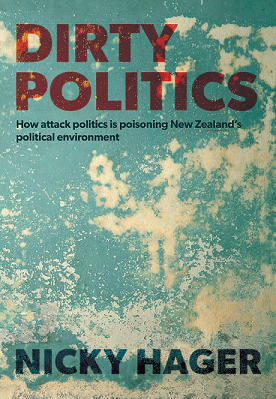 Hager’s book Dirty Politics was released last week, and much of the book’s content has been based on emails illegally sourced from the computer of blogger Cameron Slater. In the last few days a number of suspicious burglaries have been reported to the media, including one where a laptop was stolen, and another where cash and jewellery were taken. A Hamilton pensioner is the latest burglary victim to suspect something out of the ordinary. Edna Morrel, 78, said her house had been broken into three months ago. “It was all a bit odd,” said Mrs Morrell. “They took my phone and a computer, and some money sitting on the mantelpiece, but they also left quite a few valuables behind. Mrs Morrell said she was almost certainly targeted for the contents of her computer. “There’s quite a lot of valuable personal information on that computer,” she said. “There were a number of emails to and from the customer services people at Harvey Norman about a broken toaster I took back to their store. The darned thing wouldn’t cook one side properly, and when I went back to complain about it the young fellow at the counter told me there was nothing wrong with it! I had quite a considerable number of correspondences with them on the issue, let me tell you. The computer also contained copies of recent letters to Mrs Morrell’s sister. “My letters to Agnes contained a lot of very sensitive material, including details of the recent trip I took to the supermarket, and a number of cake recipes. I hate to think what someone might do with that sort of information. “Then I saw Mike Hosking on the telly the other night talking about this new book and all these terrible left-wing types, and I got suspicious,” she said. Meanwhile, a senior accountant in a Christchurch construction company is demanding to know what happened to the confidential report he left on his desk before going to lunch today. “I swear it was right there,” said Barry Singh. “It was in a brown manila folder, right there.” He pointed to a pile of papers on his desk. “The report included details of amounts spent on our recent office party. I don’t know what we’ll do if our competitors find out how much we spent on the canapés. “Who would do something like this? Who would target a well-respected company in such a cynical manner? I feel so violated. I go out to lunch for half an hour, and then I find someone has been in my office rifling through my papers! “What else have they been into? Did they access my computer? Did they take other papers? And why were they here? Pamela Gray, Mr Singh’s personal assistant, said she thought all the answers would be found in his office. But Singh remains concerned about office security. Police are also investigating whether computer hackers have accessed the laptop of an unemployed Napier man. Gert Flowers said he was working on his novel one Saturday night, when he heard a loud banging noise outside. “I do all my writing in my bedroom,” said Mr Flowers. “It’s where my creative juices flow most freely. I was at my computer writing the scene were the Barzambian battle fleet annihilates an armada sent by the Grand Galactic Federation to stifle the rebellion on the planet Zath, when I heard a crashing noise outside my window. “I raced outside and saw that something or someone had been into my rubbish bin. I figured it must have been the neighbour’s dog, so I picked up the bits of trash left lying about and went back inside, thinking nothing more of it. Mr Flowers said he immediately suspected foul play. “My computer is only three years old, and it doesn’t often crash. So I began to wonder if someone had done something to it, and then of course I began to think about all this computer hacking business in the news recently. “Then I thought about all the times my computer had crashed irecently, and it terrified me to think that someone must have been targeting me for weeks. I’ve obviously been hacked by someone who wants access to my material. Police have confirmed that they are investigating a number of other reports, including a man caught driving an unwarranted and unregistered car, and an incident at the Kaiapoi New World supermarket where a carton of eggs was dropped on the floor. But they will not say whether they believe these incidents are linked in any way to Nicky Hager’s book.